It was very thoughtful of you to write this in English. Whatever the language, you are doing wonderful work, CamyZoe. After becoming familiar on how to use Souns with my two daughters of 1 and 4 years old during the summer, I started using “Souns” in my classroom on August 2015. I’m a Special Education teacher from Lares, Puerto Rico. I work with 13 students ranging from 14 – 22 years old with moderate and severe cognitive disabilities. Before Souns, none of my students were able to recognize any letter. They were having lots of problems remembering letter names and sounds. By this month (November 2015), my students are showing progress through letter-sound association and recognitio n. I am astonished how this program is working with each one of my students. This has given them a boost to their self-esteem. Parents are so grateful, because they never thought that at this stage, their children were able to learn sounds and recognize letters the way they are doing it. The process is slowly but steady, growing each and every day. Now they loved to help each other, and help one to another when someone is struggling with a letter sound. Moreover I am learning a lot during the process and acquiring great knowledge about the fascinating link between the hand and the brain. In each classroom, with the “No, not yet!” response, we asked for two or three children who knew through the /u/ sound. In each case the children who were selected eagerly listened to the sounds in simple, phonetic words, and built the words. The teachers were so excited, as were the children. The picture above is one of those moments. Look at the joy on the children’s faces as they apply what they know about letter-sound associations to real words….building the words from sounds only (remember, no spelling)! For us, for the teachers, and for the children, it was a beautiful experience. Such activities are particularly inspiring for the children observing, those not yet to the /u/, as they see their efforts have a purpose. Certainly it is important not to set a child up for failure, so I appreciate being slower than faster for this second stage in Souns – building words. However, there is a way to be relatively sure the child is ready to listen to sounds in phonetic words and build each word – one sound at a time. When you reach /u/ in the sequence of Souns letters, it is time to build words. 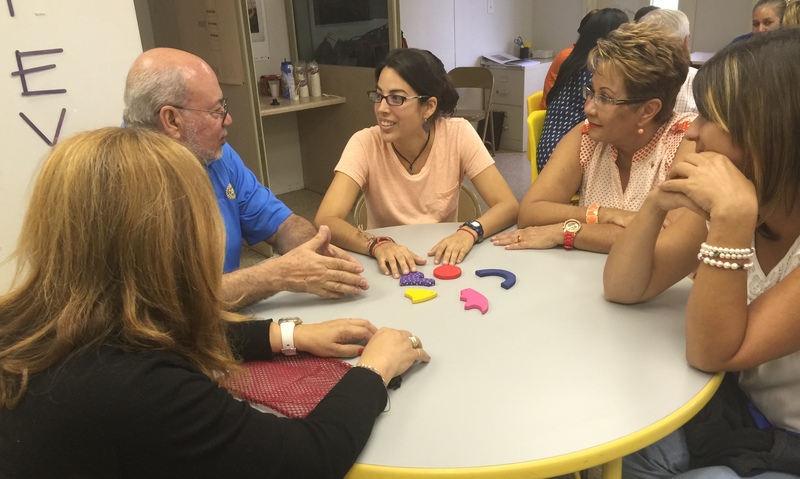 Rotarians from the Rotary Club of Peachtree City and the Rotary Club of Henry County visited Rotary District 7000 in Puerto Rico, the site of a Global Grant for teaching basic literacy skills to preschoolers attending local Head Start programs. This project is an extension of a relationship between RD6900 and RD7000 that began in November of 2011 and has involved two Matching Grants and two Global Grants. Recipients have been in both Puerto Rico and Georgia, altogether reaching over 10,000 children. Our visiting group of nine from RD6900 spent four days with Rotarians from clubs throughout Puerto Rico – RC Rio Piedras (Host Club), RC San Juan, RC Junco, RC Manatee, RC Mayaguez, RC Ciudad Del Turabo – attending Rotary Club meetings and visiting Head Start sites where the SOUNS program is being implemented with materials provided by the GG. The grant was a result of the efforts and financial support of Rotarians in both districts, lead by RC Peachtree City and RC Henry County in RD6900, and RC Rio Piedras in RD7000. Rotarians going to work (in a school bus)! Pictured are President Russ Heil, PP Ed Outlaw, and Amy Matusek of RC Peachtree City, PP Laura Crumbley and husband David, PP George Siggins and wife Mary Jane of RC Henry County, and Antonio Santos of RC Rio Piedras. Taking the pictures: Peachtree City Rotarian Brenda Erickson and husband Norman Hough. During the trip we also attended several English and Spanish-speaking Rotary Club meetings, providing us the opportunity to exchange club banners and interact with many Rotarians. The Rotarians of District 7000 and their District Governor, Jesus A. Vivas, could not have given us a more welcoming and enthusiastic reception. Pictured are RC Rio Piedras President Pedro Watlington and RC Peachtree City President Russ Heil. Exchanging banners and conversation was a constant for the trip. Engaging eight Rotary clubs across two Rotary districts makes for a jovial time! We visited nine classrooms in the three Head Start programs – San Juan, Caguas, and Mayaguez – talking with administrators, teachers, sponsoring Rotarians, and children. We were very impressed with the facilities, other teaching materials, and the professionalism of the staff. Imagine where these preschool children will be as emergent readers entering kindergarten when they are five years of age. The children in the image are building “peso” and have discovered who has the /o/…. playing to learn to read. Go teachers! Below are Laura Crumbly, George Siggins, David Crumbly, Mary Jane Siggins, Brenda Erickson, Ed Outlaw, and Amy Matusek. To sum up the trip, it was a great experience for the nine Rotarians and spouses from District 6900. It gave us a chance to see with our own eyes how the grant was successfully benefitting young children from difficult circumstances and to meet Rotarians from another country who have a real desire to build a better tomorrow for their children. Beyond that, our team got to know and enjoy each other while engaging in the hands-on work of Rotary! 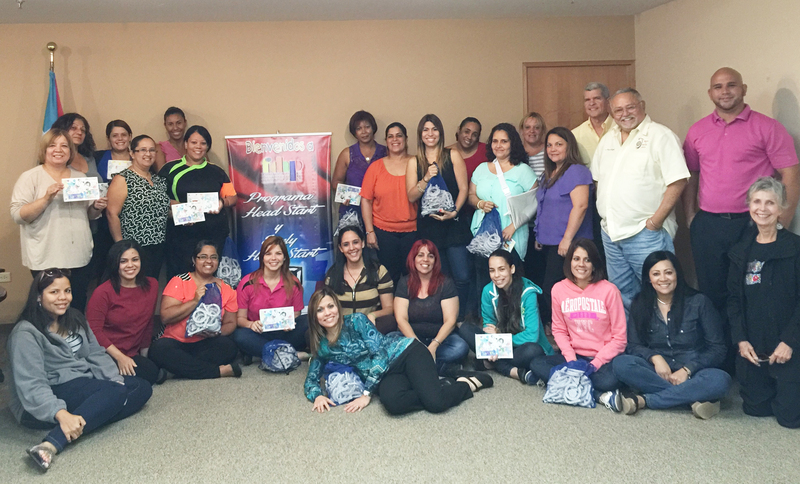 Municipio de Mayaguez Head Start were joined by RC Mayaguez for the training. 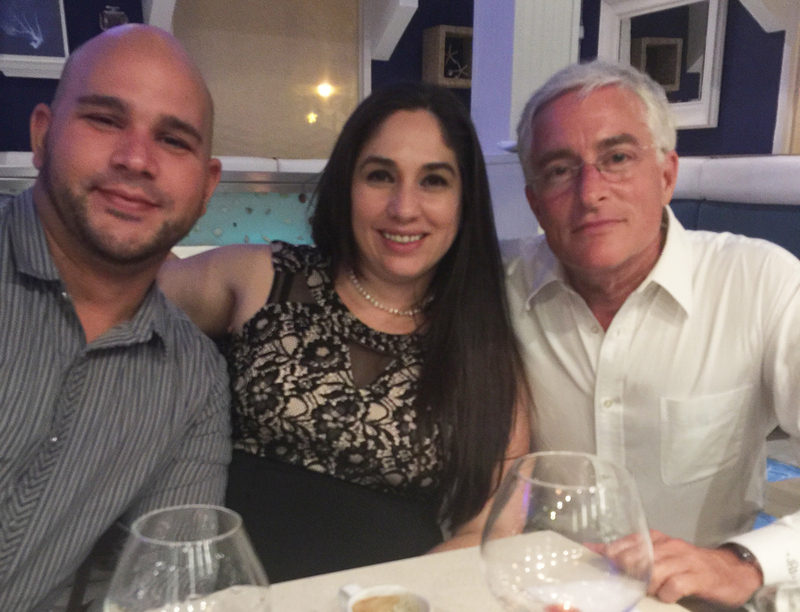 Souns training – June 29 to July 1 – in Puerto Rico was a model of engagement and promise for both Rotary and Head Start. I SO love round tables and interactive groups. Play is the best teacher at any age. If teachers, assistants, Rotarians and Rotaractors engage with one another with the Souns materials, laughing and learning, they will understand the child engaging with the materials. Fun with RC Rio Piedras, Rotaractors, and Head Start teachers learning why Souns works. One training day for each of the three Head Start programs, with two three-hour training sessions each day, prepared the teachers and assistants in 90 Head Start classrooms to implement Souns. Thanks to Rotary, each classroom has Souns materials, and the teachers have time before school begins to “play” with the materials, becoming comfortable with the hands-on, letter-sound approach. I celebrate that in each training there were Rotarians attending from local clubs (RC Mayaguez, RC Junco, RC ciudad del Turabo, RC San Juan, and RC Rio Piedras) to learn about Souns in order to support this project in their communities. The Rotaractors participating in the training expect to be involved as interns with Head Start classrooms. Indeed, it was a miraculous three days! 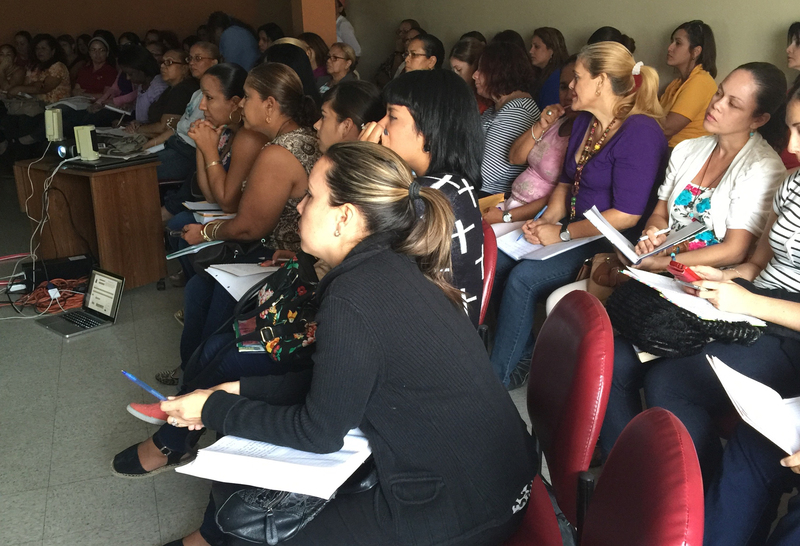 RC Junco and RC Ciudad del Turabo joined Fundación Desarrollo Hogar Propio Head Start training in Caguas. The success of this training trip had much to do with relationships established in previous Souns projects in Puerto Rico. This early literacy work began five years ago when District Governor John Richardson, Rotary District 7000, championed the Souns program for the children of Puerto Rico. PDG Richardson has continued to be the pathfinder for this work. I am so grateful to him for his energy, insight, loyalty, and determination. Another strategically critical voice that surfaced years ago in Puerto Rico is Head Start teacher, Hector Rivera. Souns was a natural for Hector. He implemented Souns with Head Start in San Juan Municipality, our very first Rotary project in Puerto Rico. I am glad to share with the world that he is now a recognized Souns trainer. Hector volunteered to do the training for this extension into three new Head Start programs in Puerto Rico. He is excellent at communicating with peers, sharing his classroom experience with the program, and ensuring others are prepared to implement Souns in their classrooms. In the challenging world of benevolent projects, Hector confirms a path to sustainability. One more H U G E thank you is in order: The current Rotary District Governor of RD7000, Jesus Vivas, has been actively supporting Souns since PDG John Richardson’s year as governor, five years ago. We received the utlimate compliment when DG Vivas, on his very first day as the official District Governor of RD7000, attended the entire morning training for Souns. He is an amazing man with a Rotarian heart! And his Rotary year has just begun! Rotary DG Jesus Vivas honors us with his presence! This early literacy project is GG1523886 sponsored by host RC Rio Piedras (RD7000) and partner RC Peachtree City (RD6900). The Rotary grant funds the Souns materials only. Souns advocates and Rotarians volunteer to do the teacher training. In the photo below, RC Peachtree City Rotarian, Brenda Erickson, demonstrates the joy and ease of the Souns program. Magically, round tables and a few minutes with a real child make a great learning experience for Head Start teachers, assistants, and Rotarians! Rotary and Head Start are working together for basic literacy. “I want to read!” is the dream – the expectation – of every child. In Puerto Rico, thanks to a collaboration between Rotary and Head Start, “I want to read!” is being turned into “I can read!” Those words are the inspiration for an early literacy project potentially reaching 4000 children per year in Puerto Rico. The Rotary grant is for three years and provides Souns for literacy materials to 200 classrooms within three programs reaching Mayaguez, Caguas, and Santurce. Souns will be distributed as teachers opt into the program and are trained. This is a three-year project, so there is time to progress in a responsible and controlled way to best ensure sustainability after the life of the grant. Children want to read, and the minds and hearts of those at the table in this project intend to make that dream possible. This is the third Rotary/Head Start collaboration in Puerto Rico. The first two provided Souns to the San Juan Municipality Head Start program, with each project being one year in duration. We celebrate that Rotarians and Head Start teachers from those projects continue to work together to ensure growing success past the life of those grants. The gentleman in the image is from the San Juan Municipality program and is assisting in the planning for the current project with New York Foundling Head Start. Also included in the new project are the Head Start programs Estado Libre Asociado de Puerto Rico Municipio de Mayaguez and Fundación para el Desarrollo del Hogar Propio, Inc.
Rotary District 6900, Rotary District 7000, and The Rotary Foundation have supported the project initiated by host club, RC Rio Piedras (D7000), and international partner club, RC Peachtree City (D6900). 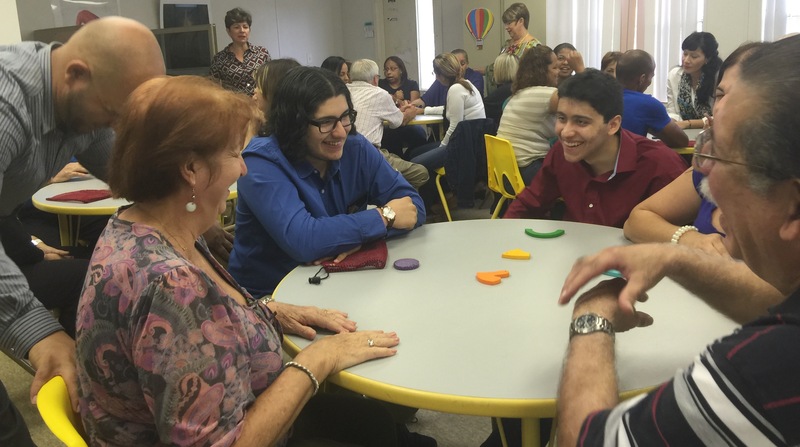 Across Rotary Districts there are, to date, four clubs joining RC Rio Piedras and RC Peachtree City to mentor the program in Head Start classrooms: RC Henry County, RC Mayaguez, RC Ciudad del Turabo, and RC San Juan. Rotary International is committed to building basic literacy, and these clubs are demonstrating Rotarians at work for literacy. Success with a project requires strong leaders like these from RC Rio Piedras: (right) District Governor Elect Jesus Vivas and Mrs. Vivas, and (left) President Elect Peyo Watlington and Mrs. Watlington. I am grateful to represent my club, RC Peachtree City. This entry is from Rotary Project Contact, Robin Jones, of the Rotary Club of Pretoria East in South Africa. Children have eager minds! They love to learn. It is important to take advantage of that predisposition to learning in the early years by providing rich, life-related experiences in the classroom. 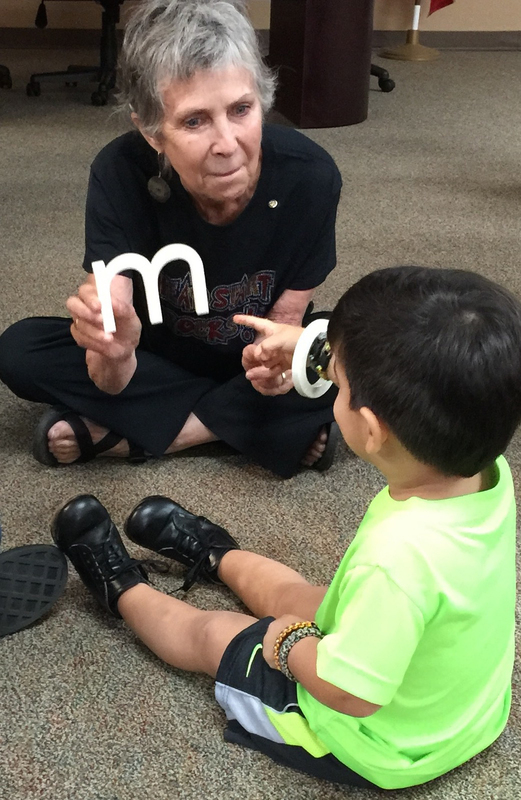 One classroom option that builds early literacy skills is Souns for literacy. Souns is a hands-on programme that was initially introduced to classrooms in Khayalitsha and Knysna through Rotary Clubs of Seapoint and Knysna over five years ago. The specific schools were the Ilitha School in Khayalitsha and preschools under the umbrella of Knysna Education Trust in Knysna. Success through the Souns programme led to further support in Knysna from DG Murray Trust and for foundation stage learners in Pretoria through the Rotary Club of Pretoria East. Collaboration has fuelled the path to learners to date and will hopefully provide access to even more learners in the future. SOUNS is a simple, effective, user-friendly programme to ease learners along the first steps to becoming effective readers, opening the doors to a literate future. Children are first taught the sounds of the language, then, through engaging activities, they are taught the symbols associated with the sounds (letters), then once sufficient sound-symbol associations are known, they are taught to build words (phonetic writing). Once the learners are confident word builders (writers), they move naturally to blending symbols into words (phonetic reading). Souns works so well that there is an initiative on several fronts to replicate the programme so that more children can have access to the materials. The programme currently reaches children across languages and in diverse learning environments from villages served by the Peace Corps to teacher training organizations reaching hundreds of classrooms in many provinces. Propelled by research based on years of using Souns, the Knysna Education Trust has developed a prototype – Fonix – that will be less expensive and therefore reach more classrooms. Efforts in Pretoria are currently engaged in building prototypes as well. Cooperation and collaboration is the proven key to progress. The Souns programme reaches over 15000 learners annually and will continue to expand, limited only by available resources. Rotary is convinced this programme works and is grateful to know DG Murray Trust is involved. Partnerships are critically needed to expand the programme to benefit new groups of learners every year. Pretoria based project: http://www.rotarypretoriaeast.org.za/services_globalgrants.htm . A preschool learner using Souns builds an isiXhosa word – isele – by listening to sounds in the word. During my recent trip to South Africa, I visited an organization I have worked with for many years, implementing the Souns program. While in their office I saw a letter m similar in font and size to the authorized Souns letter, but different in material, texture, and color. What was happening? As I asked for understanding and details, each person passed me off to the next. Eventually I was told the organization intended to create their own program, based on but independent of the Souns program. What I felt? I was enraged by not being informed of such plans. I was concerned because the quality of any imitation will directly impact the reputation of Souns and safety of children. I was challenged because I must accept that imitation is likely if the program is working. What matters? Good practice and quality of materials are paramount. Any materials used for the letters must be tested to confirm they are safe for hands and mouths of infants and toddlers. Good practice with Souns is described in the SounsGuide. What next? I will design a platform from which Souns-like programs can be identified and acknowledged. The responsibility will be transparency, good practice, and safety in materials. I must take this experience and build forward, guided by my own words: until every child reads! Shhh!…there is a conversation happening between the hand and the brain!